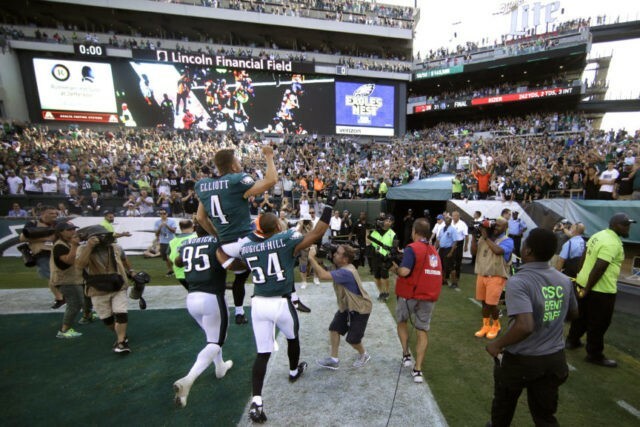 PHILADELPHIA (AP) — Jake Elliott ran over to coaches and begged for a chance to try the longest field goal in team history. They said yes — and he nailed it. Elliott kicked a 61-yarder as the clock expired to lift the Philadelphia Eagles to a 27-24 victory over the New York Giants on Sunday. “I had so much confidence in him,” Pederson said. Eli Manning threw three touchdown passes in the fourth quarter, including a 77-yard score to Sterling Shepard, but Philadelphia (2-1) rallied twice. “We have to play better football,” Manning said. Elliott hit a 46-yard field goal to tie it with 51 seconds left after Aldrick Rosas kicked a 41-yarder to put the Giants ahead. The Giants (0-3) hadn’t scored 20 points in eight straight games before Manning led them to 21 in a span of 5:21. He tossed TD passes of 10 yards and 4 yards to Odell Beckham Jr. to tie it at 14. Manning then connected over the middle to Shepard, who broke a couple tackles and sprinted all the way for a 21-14 lead. A 36-yard penalty for pass interference on Eli Apple put the ball at the 15 and rookie Corey Clement ran in on the next play for his first career TD to make it 21-all. On a hot, humid day, the NFC East rivals looked sloppy for the first three quarters. Down 14-0, the Giants finally got going when Manning threw a 10-yard TD to Beckham to cut it to 14-7. Beckham drew an unsportsmanlike penalty for his celebration. Down on all fours, Beckham took a few steps and then lifted his right leg in the air, imitating a dog urinating. “That’s not smart football,” Giants coach Ben McAdoo said. But the penalty wasn’t costly. New York quickly got the ball back at Philadelphia’s 33 when Landon Collins forced Zach Ertz to fumble and Apple recovered at the Eagles 33. Orleans Darkwa ran 20 yards to the 6. Beckham then made a spectacular, one-handed grab for a 4-yard TD to tie it at 14. The Eagles went up 7-0 on LeGarrette Blount’s 1-yard TD run that capped an 18-play, 90-yard drive. Blount had a rumbling 17-yard run early in the drive and Wentz later kept it going with a nifty, 11-yard scramble on third-and-8. Manning’s second pick came on a tipped ball that came down into Patrick Robinson’s hands in the third quarter. Wentz threw a 3-yard TD pass to Ertz on the ensuing possession to give Philadelphia a 14-0 lead. Manning was 35 of 47 for 366 yards, three TDs and two interceptions. Went was 21 of 31 for 176 yards, one TD and no picks. Giants: Beckham had nine catches for 79 yards and two TDs. Shepard had seven receptions for 133 yards and one score. Brandon Marshall caught eight passes for 66 yards. Eagles: Wendell Smallwood ran for 71 yards and Blount had 67 yards and one TD. Darkwa was stopped by Joe Walker and Vinny Curry on fourth down from inside the 1 in the final minute of the first half. Manning had tossed a 2-yard TD to Shepard, but he was ruled out at the 1 after a review. Giants: Defensive end Olivier Vernon (ankle) and Darkwa (back) left in the fourth quarter. Eagles: Pro Bowl defensive tackle Fletcher Cox (calf), running back Darren Sproles (wrist) and linebacker Jordan Hicks (ankle) left in the first half. Giants: Manning threw incomplete on fourth-and-2 from the Eagles 13 with 1:17 left in the third quarter. Eagles: Elliott had plenty of distance on a 52-yard field goal try that sailed wide left in the third quarter. Eagles: at Los Angeles Chargers.